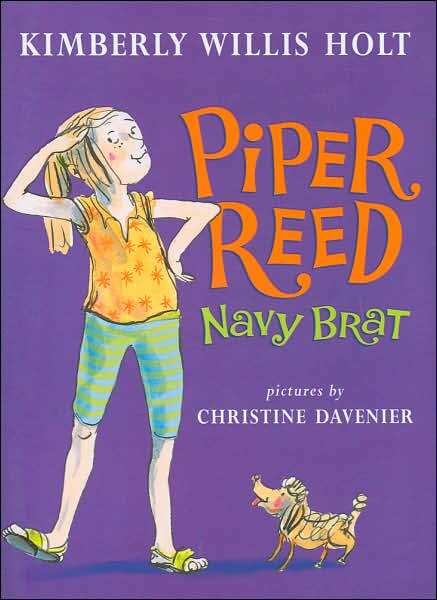 Piper Reed, Navy Brat is a good book. It is about a girl that has to move alot 'cause her dad is in the Navy. She has to make a lot of friends, and she is good at it too. Piper Reed is a feisty, fun girl, and her little sister is really smart! Her big sister is sort of mean and sort of nice. When Piper grows up, she wants to be one of the Blue Angels-Navy pilots that are real daredevils- and I think she could do it! My Mommy-Daughter book group read Piper Reed and then we got to meet the author, Kimberly Willis Holt, and she signed our books. We talked to her about how she came up with the story and found out that it is a story about her life as a kid! We learned from her that all fiction stories are real in some ways. Kimberly Willis Holt also told us that Piper Reed will be a series and I can't wait to read the next book!